But what’s this? Couldn’t make it through century two, then? In the spirit of that ridiculousness, tomorrow I’ll be establishing an amusement park: Fast Rides of the Near Future. Anyone got any rides I can borrow? Free entry for a year if you do! 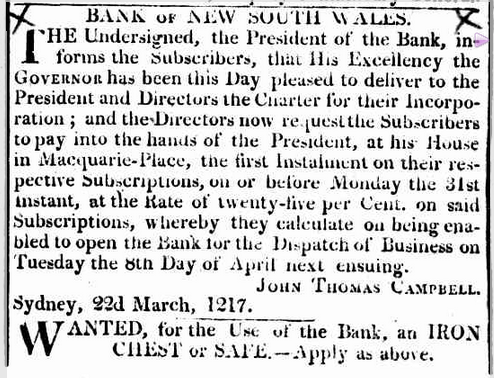 In 1860, the BoNSW started to branch out – literally. 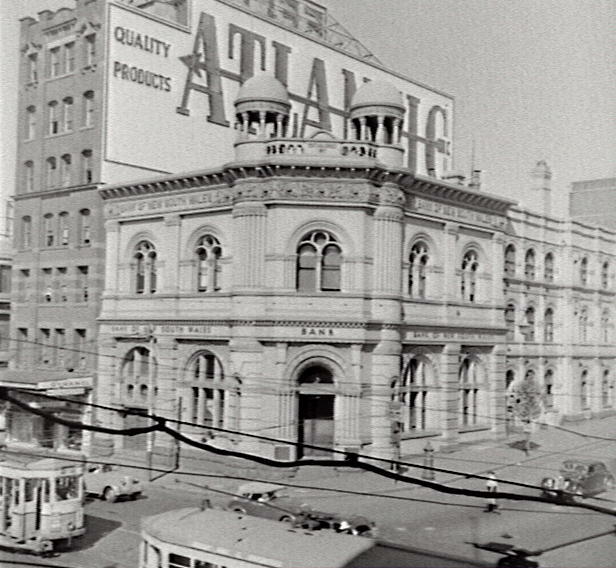 The bank’s first branch was established here on Broadway that year. But what flies in the ’60s sinks in the ’90s, and by 1894 changes had to be made. The powers that be summoned Varney Parkes (son of Sir Henry and former Bank of NSW employee) to design the current building (complete with it’s own gold smelting facility), unceremoniously treating their number one son like number two in the process. In fact (as we’ll see), that plaque at the top of the page is about as sentimental as Westpac cares to get (but remember, you’re not just a number 🙂 ). Actually, maybe in 1955 you were. Oh, check it out: the postbox by the corner is still there! 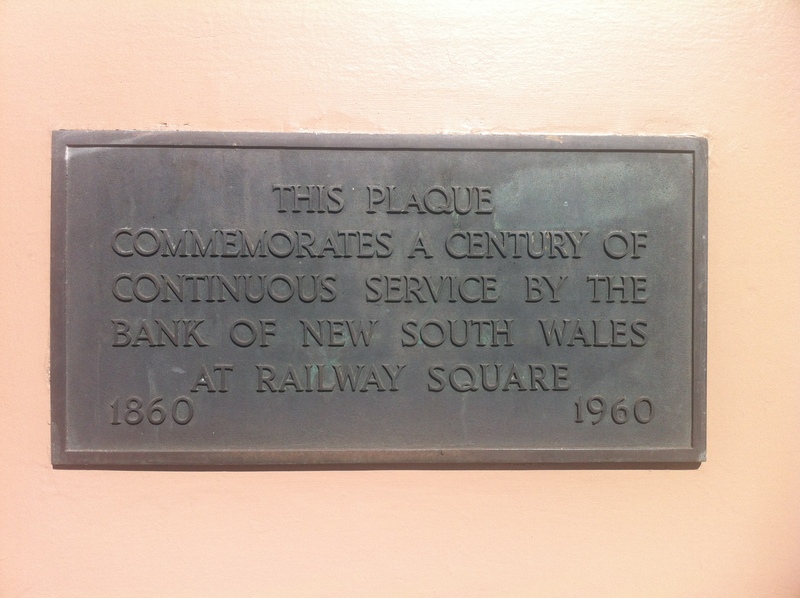 1982 saw the Bank of NSW merge with the Commercial Bank of Australia to form Westpac, presumably to confuse customers. You can guarantee they would have netted some poor old biddy’s cash in the changeover. 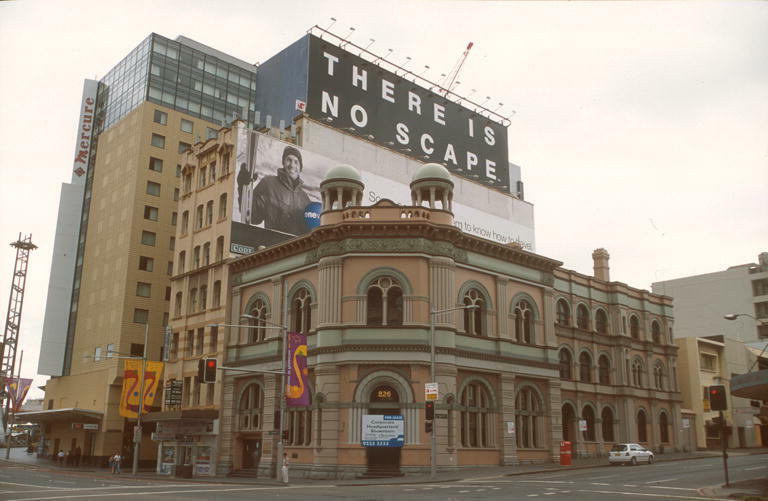 To aid the public through this confusing time, all branches were poorly rebranded with the Westpac name, and the Railway Square spot was no different. Here it is in 1992, in glorious colour for the first time. In that same year, Westpac suffered a $1.6b loss, a record for any Australian corporation at the time. Staff were let go en masse, and that would had to have affected this branch. 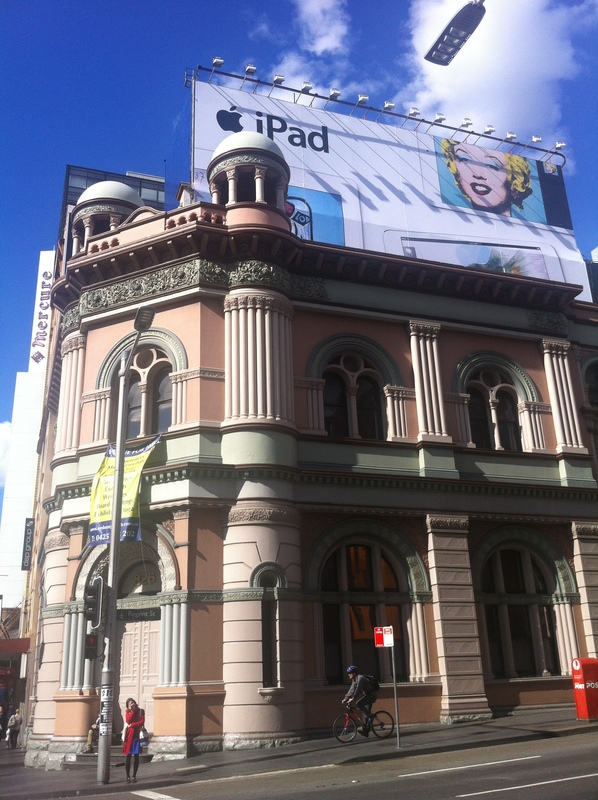 Luckily, anyone forced out the door would have seen the old Sydney City Mission logo behind them there. I wonder whatever happened to that? Someone should get on that. 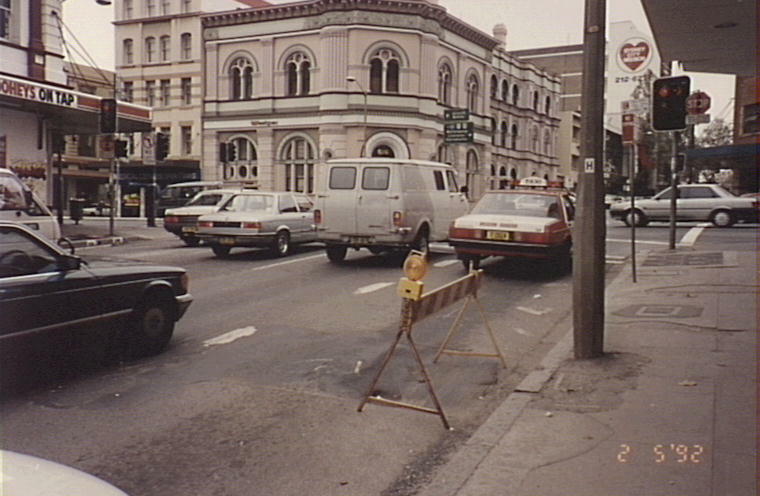 Despite Westpac’s extensive refurbishment of the building in 1989-90, the bank was hit too hard by ’92’s recession. 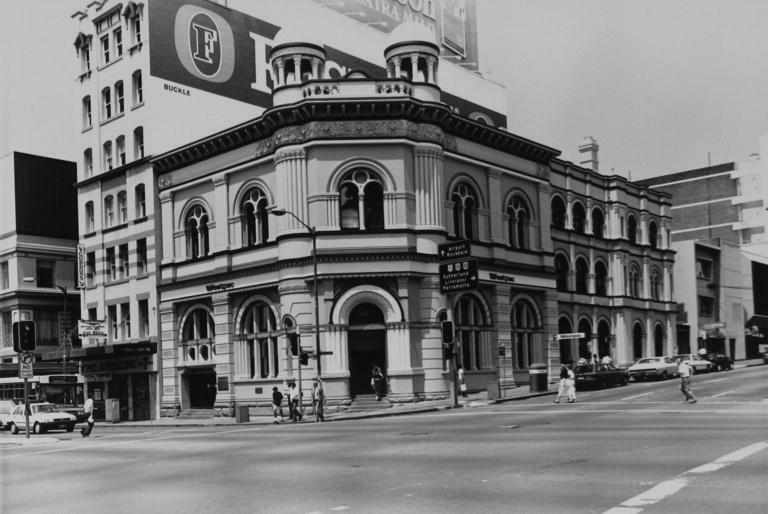 By 2000, the building that had once been the bank’s pride and joy was just another ‘For Lease’ along George Street, just in time for the Olympics.